Yeah sure, Australia finally batted like blokes who remember how to play cricket. They remembered that it’s not compulsory to hit every ball. Sure, they played as though there were five days, and at least saw out more overs than a Caribbean Premier League chase. Sure, the top three each faced 100 balls or more, up from a collective total of eight at Trent Bridge. Sure, we got back to a proper day’s Test cricket, with a sensible score by stumps, and went on to a better score on day two, and now have the prospect of play on perhaps a fourth day, and nobody actually outright laughing in our faces if we mention a fifth, and if it only goes three it will be England’s fault and the Australians might save some face, and blah blah blah. But seriously, how much more fun could this have been? Instead of looking for the greatest entertainment, Darren Lehmann and company have shown a juvenile fixation with not losing. But really. We have the fifth Test in a decided series with nothing to play for bar spectator interest and player pride. Imagine what we could have done. Farewells are great, for starters. Saying goodbye to things – it makes us feel like we have feelings about something we never noticed before, but now that it’s leaving we have to pretend we did. Imagine a ship is pulling away into the distance. Imagine you’re madly waving your handkerchief at a distant figure by the rail. See them receding? Do you feel wistful? Haha, they’re not real. Sucker. Okay, so Michael Clarke is real, and he’s going. Chris Rogers is going too. Some people reckon Peter Siddle is going. He’s not, but let’s say he is for the sake of argument. Brad Haddin is gone. Why not a farewell for Ryan Harris? We know that he’s literally held together with fencing wire and the fervent prayer of a Cricket Australia monastery, but he doesn’t have to bowl. We could have chucked him in our middle order to tee off at six where his professional career began. It couldn’t have made things worse than before. In fact, while we’re farewelling, why didn’t we get Ian Healy down? Being denied a send-off rankled with Heals, to the point that he’s visited years of his television commentary on us as a cruel and elaborate revenge. But as his work on the Sky Sports masterclass showed on its 61st repeat, the chap still has the goods when it comes to gloving a ripping leg-break and humiliating Mark Butcher. If we only had him do it while eating some incredibly chewy Wonka toffee. Balancing those farewells, we should have kept an eye on the future. And comedy. Shaun Marsh is all about the latter. Like 11 Shield tons in 15 seasons. Or 27 Test innings for seven ducks, or 11 scores under four, or 17 scores under 20. The world’s worst bingo card. We could have had him opening. Get his brother alongside to confuse the bowlers and the commentators. Gold from start to finish. That would have meant spicing up our dreary opening partnership, with their tedious century stands. But if Chris Rogers and David Warner are such good buds, get them on with the new ball. Take that relationship to the next level. Pair Warner’s legspin and seam with whatever Rogers bowls. Quiches? Spares? If I don’t know, then neither do England’s batsmen. Next, can I remind you who is lurking around Yorkshire, kicking cans and menacing local cats with his slingshot? A certain cheeky fellow with simian arms and fast-twitch muscle fibres and a glint in his eye? A certain Maxwell, first name Glenn? You can’t deny that G-Max brings the hilarity. And is coincidentally the name of a manly brand of disposable razor. Men’s razors are different to women’s razors because women’s razors are pink and called things like Goddess Flower Party. Men’s razors are chunky and black-with-fluoro-bits and have hyphens. These are important technical differences based on the gender of skin. In his first Test series in India, Maxi came in as a dashing allrounder who wasn’t necessarily great at anything, and opened both the batting and the bowling. In the United Arab Emirates, needing to bat out a draw from 603 runs behind, Maxi came in at first drop and played a reverse sweep from his eighth ball. He didn’t get out to that reverse sweep, contrary to popular belief. But it showed a statement of intent. An intent not to remotely consider the circumstances of the match. Because when people do that, they confuse themselves and get out. He did get out for 4 playing back on his stumps, but he did it with a very clear head. That’s the clarity Australia needs. Goodbyes require some hellos. What says hello like a reverse sweep? It’s also worth noting that Maxi just made 140 for Yorkshire against a strong Durham attack on a seaming deck. But the main thing is, he’s so lovable. And he could have split an Uber to the ground with James Faulkner. Now, remember who asked Maxwell to open the batting and bowling? Recall the name of that visionary tactician? 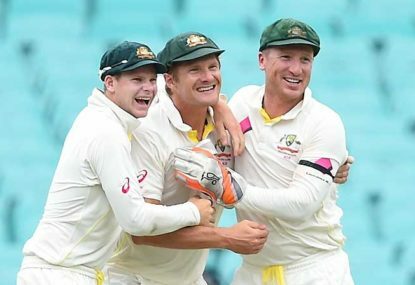 Oh, no big deal, it’s just Australia’s 44th Test captain, Shane Roger Watson. While we’re fussing with farewells, some people are writing off The Big Rig’s career as well. Comical as it may be to have the poor bugger wearing an orange vest for five days like a moonlighting road worker and popping glamour shoots on the team balcony, surely it would have been more fun to have him in the XI? England can’t give him a guard of honour every time he runs on with drinks. We should have got him involved, so he could draw ten edges that don’t go to hand, look agonised with each play and miss (whether bowling or batting) and register a pair of leg-befores for 32 apiece. But most importantly, we should have given him the captaincy. One last Test at the top. That way he could have bowled what he wanted, bowled when he wanted, and batted Clarke at number nine. Imagine the slip cordon chats. And the make-up pash. Smith would have made way to accommodate Jorge Luis Voges, the man to lead Australia through the labyrinth and avoid a universal history of infamy. Or we’d have replaced Voges with Stephen Fry, who is always lurking about the Oval looking for something to do. With the bowlers, we’d have needed Fawad Ahmed to keep the run-rate humming, and wouldn’t have required any fast bowlers given the 93 unchanged overs that Clarke would have delivered for his skipper. It’s all so obvious in hindsight. This was the future for Australia, the start of a new golden dawn during which most of the side would have retired. Retirements at dawn mean triumph by sunset, in an old saying of John Buchanan’s. Huddle close, the wolf hunts by starlight. The XI: Marsh, Marsh, Watson (c), Maxwell, Fry, Harris, Healy (wk), Fawad, Clarke, Rogers, Warner. It’s not the team Australia got, but it’s the team we deserved.